Mobile operator Orange UK and credit card company Barclaycard have announced a long-term strategic partnership to develop m-payments technology including mobile wallet handsets. Barclays chose CHYP to assemble product requirements into an initial specification, help to develop the functional specification for the product provisioning and management across the NFC ecosystem and to develop working prototypes to demonstrate concepts. I'm really looking forward to seeing the first fruits of this partnership -- an Orange phone that has a Barclays MasterCard built in to it -- arrive in the shops in the not-too-distant future, building on Barclays' rapid transition to contactless technology in the card space. 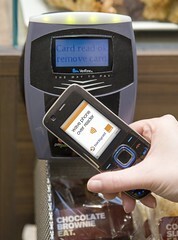 [Barclays] will deliver the new contactless cards to customers when their current cards need to be replaced. New customers signing up to a Barclays current account will also receive the new type of card. The bank estimates that up to three million customers will be using contactless debit cards by the end of the year [and] the majority of Barclays debit card customers will have contactless cards by 2011. This is a great time to be in payments! One of the press reports I saw about this announcement said that it would be the biggest revolution in retail payments since plastic cards were introduced. Unusually for the technology press, this time the hype may well be justified. Why? Well, I was interviewed by a magazine earlier today and I made this point: our experiences working on pilots and trials that involved real consumers making real payments in real merchants were that consumers didn't regard having payment cards, transit cards and loyalty cards built in to their phones as some kind of science fiction marvel brought to life. In an odd (to me) way, they sort of expected their phones to go in that direction anyway. It was as if you were bringing them something they thought they were going to get. And they really liked it: the results from the London pilot last year were incredibly positive. Convenience, rather than security, will be the driving force behind the U.K. adoption of new payment methods, according to an independent survey of 1,000 British consumers. There's absolutely no doubt that the convenience factor is key here and it's not just about payments, it's about the value-added services that go around payment: everything from loyalty to e-receipts. Moving from the card to the phone opens up a whole new world. I was interviewed by a magazine earlier today and I made this point: our experiences working on pilots and trials that involved real consumers making real payments in real merchants were that consumers didn't regard having payment cards, transit cards and loyalty cards built in to their phones as some kind of science fiction marvel brought to life. You're right about the need for readers, but I'm sure that the calculation they are making is that readers are being rolled out (slowly) for contactless chat anyway, so the mobile can run on the same rails. In fact, some observers think that the only reason by some people are interested in contactless is as a stepping stone to mobile, which is where the additional value-added can be found. Ugh. Is there a saving for the merchant somewhere? Incremental revenue? I guess your overriding point might be that customer expect this functionality. You're right about the need for readers, but I'm sure that the calculation they are making is that readers are being rolled out (slowly) for contactless cards anyway, so the mobile can run on the same rails. Dave, I agree there is utility in NFC, but it seems to imply a huge investment in readers, marketing and so on by the high street retail community at a time when it's already under massive financial pressure. Meanwhile, online retail sales are growing apace, where no such investment is required because card numbers are used electronically anyway. Won't these additional costs just add impetus to the development of online retail channels?